When I heard about the Golden Deli fire a while back, I had to drive over to Main/Mission to see for myself. My dad actually CALLED me to inform me of this tragedy, but reassured me that Golden Deli had lucked out. Turns out that everything to the right of Golden Deli had been burned down, including 7-11, a laundromat, a Chinese DVD store ironically named Firelink and a random gift shop that sells those ugly head visors you see Chinese people sporting these days. Sure enough, the God of Pho, extinguished the fire before it could burn down what San Gabriel Valley hails as the Shrine of Pho. 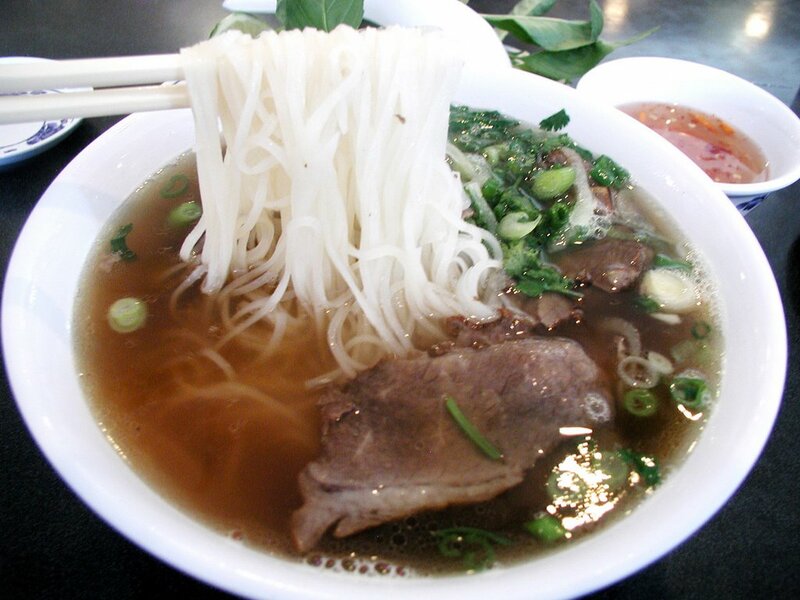 Much like pizza and sushi in LA, the discussion of the Best Pho in the San Gabriel Valley can turn into a sour riot - with people overturning cars and vandalising property. In my opinion, I put Golden Deli #1. Here's my review on my top three places in SGV. For those that are fans of Golden Deli, you probably know that Vietnam House right across the street is owned by a relative. 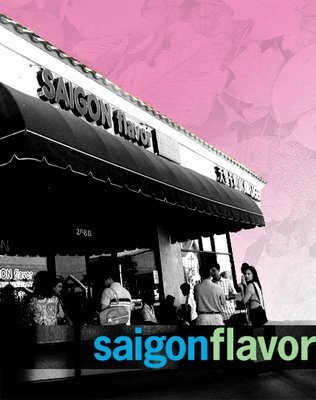 But they also have another sister restaurant, Saigon Flavor on Valley/Del Mar. Woohoo! I've been to Vietnam House and tasted no difference in the pho - it was perfect. Although some people may turn to Vietnam House and Saigon Flavor as an alternative to waiting the usual 20 minutes at Golden Deli, they will soon find that you can't beat around the bush. People know the quality of all three of these restaurants. 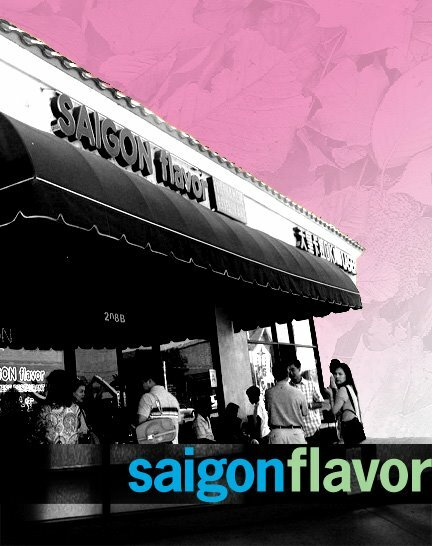 Before going to the Banksy art exhibition in the warehouse district of LA, I headed over to Saigon Flavor for the quelling of a severe hangover. Pho is really the best solution to a hangover. The flavoring of the soup wakes you up and makes you smile. I parked right in front and found myself writing my name on a clipboard. Crap, there were 6 other parties in front of me. Eventually I got called and got put at a table for six. I felt bad and told the server that I wouldn't mind waiting for a single table. She put me there anyway. Embarrassed by the fact that I occupied a sixth of the table, I quickly ordered my usual Pho Chin Nam (well-done brisket) and a side order of two egg rolls. Glancing at the menu, I noticed that it was exactly the same as GD and VH's. Quality-assured. 10 minutes later, my piping hot bowl of goodness arrived. I eventually swapped seats with a party of 4. 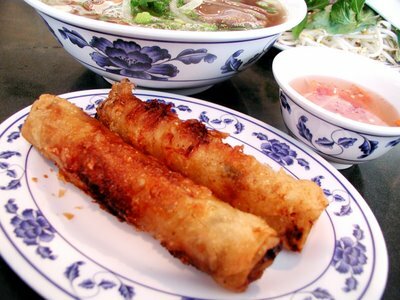 Hands down the best Vietnamese egg rolls I've ever eaten. These were like taquitos! Much bigger than the ones served at GD. GD/VH/SF all serve 5 egg rolls per order, unlike the usual 4 at other restaurants. How do they make their skin so flaky/crispy?! 2 egg rolls $1.60 with no fixings. I think it's $5.95 for 5 egg rolls. The reason I love Golden Deli is because of their soup quality. Look at the deep brown color in the broth. It's a result of a longer browning process with the bones and the addition of browned onions. The soup is clear and never fatty. Of course, there is the magic of MSG. 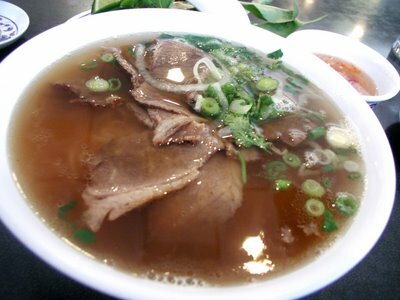 Compared to other Vietnamese restaurants, I don't feel as thirsty after eating GD's pho. GD really gives you a decent portion of beef. Sometimes I have to take them out of the bowl and set them aside. They get in the way of the noodles! Again, here's the link to my three favorite pho restaurants in San Gabriel Valley. Thanks for reading.